Thanks for liking DeSmogBlog. Like TIME on Facebook for more trusted news analysis, award-winning multimedia & behind-the-scenes looks with TIME editors. A corporate smoke screen surrounds much of the coverage of climate-change and energy issues. Fossil-fuel companies have spent millions funding anti-global-warming think tanks, purposely creating a climate of doubt around the science. 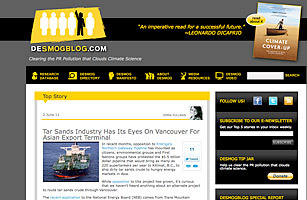 DeSmogBlog is the antidote to that obfuscation. Started in 2006 by James Hoogan, a Canadian p.r. guru, DeSmogBlog dissects the half truths and outright lies around climate change, acting as an aggregator for smart research and opinion on green issues. If it sometimes goes too far  as with its jihad against gas fracking  DeSmogBlog is nevertheless a necessary corrective.